For many years we have offered a free service to obtain near-live ship reports by email request. The process is described at starpath.com/shipreports. Until last week, these reports were only available in text format, but now we have added a GPX file of the reports so they can be imported into a navigation program for direct comparison with the latest model forecast—or more generally, just to see where they are relative to you. Once we are underway, we have only three ways to evaluate the model forecasts: our own measurements of wind and pressure, ASCAT wind speed and direction, and ship reports of direct observations of wind, pressure, and sea state by participating ships. Our own data are continuous, and with calibrated wind instruments and careful resolution of true wind from from apparent, remain the primary truth meter. Our only requirement then is to be sure to have a log entry of this data at the synoptic times (00, 06, 12, 18z). ASCAT wind speed and direction are available to us underway in GRIB format or in graphic display (see Modern Marine Weather, 3rd ed for the details), but these data are only available to us within some 300 nmi of our position maybe twice a day. Perhaps more often in some cases, and in some cases data farther from us is still useful to evaluate forecasts. The value of ship reports varies from none, when well away from typical traffic routes and no reports are available, to extremely valuable when there are numerous reports. On the other hand, in some cases, even a single report can be extremely valuable when risky decisions must be made at a time when there is some question about the forecasts. 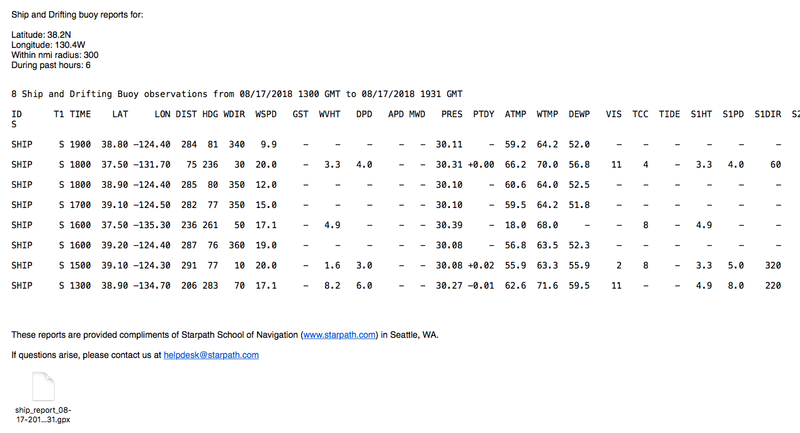 Ship reports can also be used as a way to calibrate your barometer if that was not done ahead of time. Comparing the surface analysis isobars along with ship reports at the same time with your own barometer reading at a synoptic time can home in your correction fairly quickly. We typically get most ship reports at the synoptic times. In some cases, you might even have a "buddy boat" ship that is on a course across a crucial corner of the weather map you care about, who is giving you a report every hour. This happens more often than one might guess—but there is no way to have known that without using the convenience of our new reporting system. In coastal waters, there are numerous ships traveling along the coast giving reports every hour. You choose a Lat, Lon in decimal degrees, i.e., 38N, 130W, and put that in the subject line of an email to shipreports@starpath.com. What is in the rest of the mail does not matter. Our server looks for these every 1 min, and promptly sends back an email to you with all reports within 300 nmi of that location that were reported over the past 6 hr. You can use tenths of a degree if that improves what you are after, i.e., 38.2N, 130.4W. This is a global system, so it includes all vessels taking part in the WMO Voluntary Observing Ship Program, although we rely here specifically on the US VOS Program and NDBC's compilation of the global reports. You can try it now: Get a sample set of reports. The return mail includes a formatted list of the reports as shown below, along with an attached GPX file that converts all the reporting positions into waypoints named after the time of the report. The description tag of the waypoint includes the key parts of the reports (wind, pressure, waves)—there is more info in the text versions. The abbreviations and units used can be obtained by sending email to shipreports@starpath.com with the word "help" in the subject line (no quote marks; not case sensitive). Unfortunately the NDBC does not have a marine friendly units option. This we live with every time we ask for a buoy report for local waters. You can choose "metric" and that will give you pressure in mb, but then you live with wind speed in m/s, heights in meters, and temperatures in ºC. 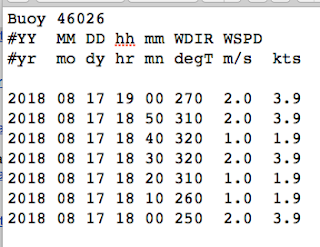 Or you can choose "English" in which case you get wind in kts, heights in ft, temp in ºF, but we have to live with pressure given as inches of mercury... as if we are an airplane or home watching TV. We have chosen "English" as the least awkward for our text reports, but since we make the GPX files ourselves, we use marine units in the waypoint descriptions. 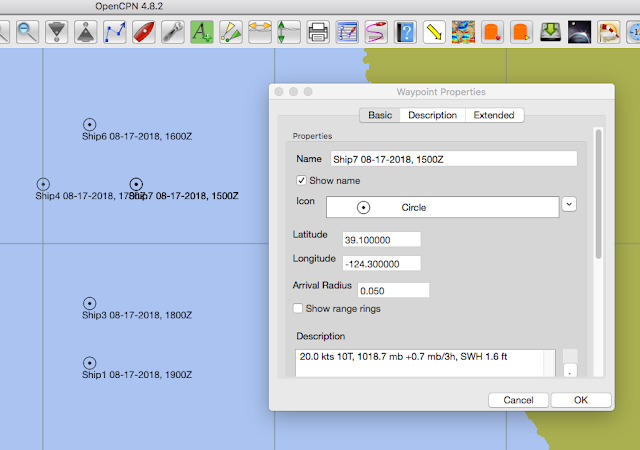 The GPX file is named by the UTC of your request. To see what this looks like if you do not have a navigation program handy, open Google Earth and drag the GPX file attachment right out of the email and onto the screen of Google Earth (GE), to see a display like the one below. Click any of the waypoints (named by the times of the individual reports) to see the details, as shown. Since the GPX files have unique names, you can choose to save these in GE My Places, or just close GE and they will be erased. To view all ship all available ship and buoy reports in GE, see this video where we describe the process—it is strangely a bit of a secret! That function, however, updates with only most recent observations each time you open it, so you do not get to see the trail of "buddy ship" reports mentioned above. 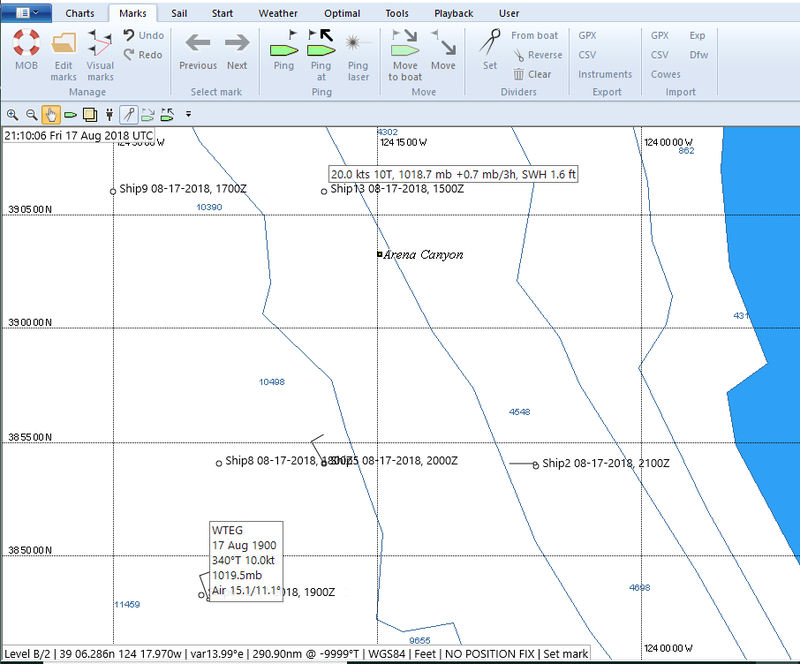 Later I will add a video of the process of using ship reports to evaluate a forecast, but for now we conclude with these brief notes on how the GPX file appears in several popular navigation programs—for the moment, I do not know of any stand-alone GRIB viewers that can import a GPX file of waypoints. In the samples below, we have zoomed in, so not all reports in the GPX file are showing. OpenCPN. Use Routes and Mark Manager link at the bottom to import the GPX. Then click one to open the properties window, then you can click others to view the data in this same window. Coastal Explorer. Use Voyage Plan/Files/Import Objects/Other files. Zoom in to see the labels. Click a report to see details as shown above. TimeZero. 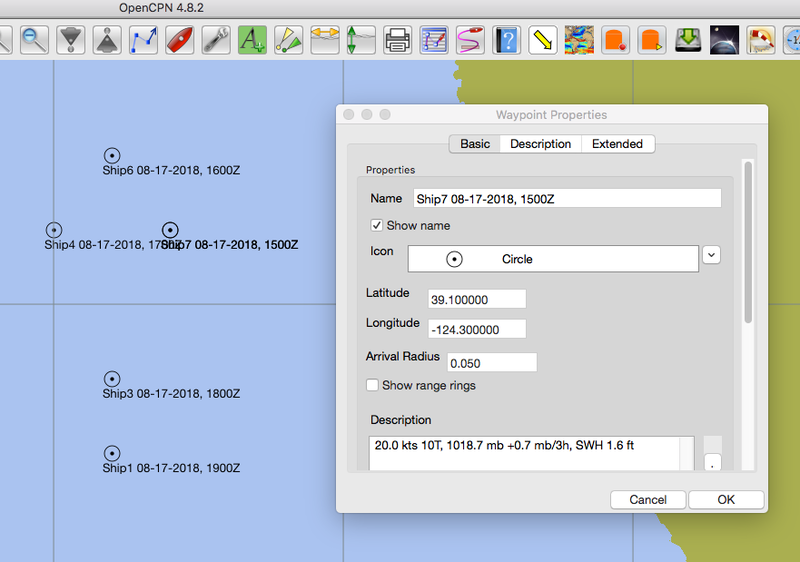 Use Import/Export, choose GPX and Marks. Click a mark to view data. Waypoint labels are small and not apparent till zoomed in. WinGPS Voyager. Use File/Import/GPX. Once loaded, select all, and import. For this particular application, this program has a convenient default display that shows waypoint descriptions, so no clicking needed. Expedition shown below is unique as far as I know as the only nav program that has a built in option to download recent observations. It is on the Weather menu/Download. There is a drop down showing the various sources of the data, but these are not selectable choices. Choose a range from the vessel location, and then receive all latest available observations within that range. Above is an example of the observations display in Expedition. Observations over the past three hours are included, thus we see buoy reports with multiple winds, which is a nice way to note they are changing over this time period. Sometimes there are two reports from the same ship, but rarely more. A mouse over the symbol brings up the data. I have superimposed the buoy 46026 popup manually. Below are the wind reports at that buoy from NDBC, which shows the spread indicated in the Expedition display (I added the kts column). 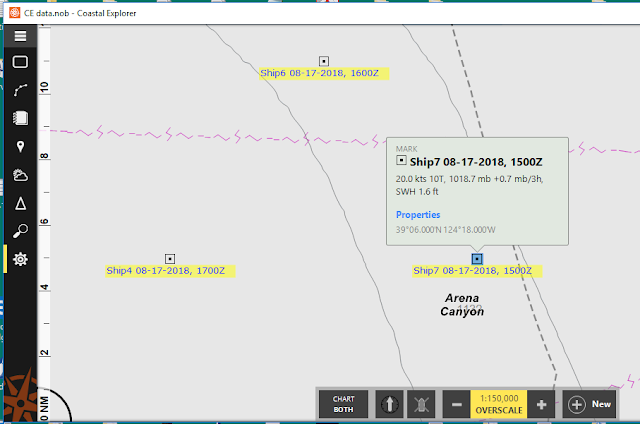 Expedition users do not have much call for our ship reports service, but it could be interesting to compare them, especially when trying to identify the route of a specific vessel. 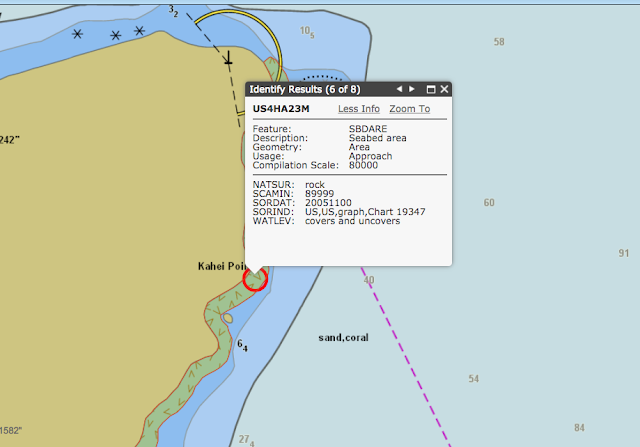 Also we can bring in reports for any location, which would save moving the vessel. An example of our ship reports GPX imported into Expedition is shown below, while it is showing its own observations display over the same region. The Expedition reports are marked by a wind barb. Expedition. On Marks menu, import GPX. Then in Edit Marks make the GPX folder Always draw. Then in Settings/Display/Other add a check to Ships and Weather Buoys, else they will not show up. 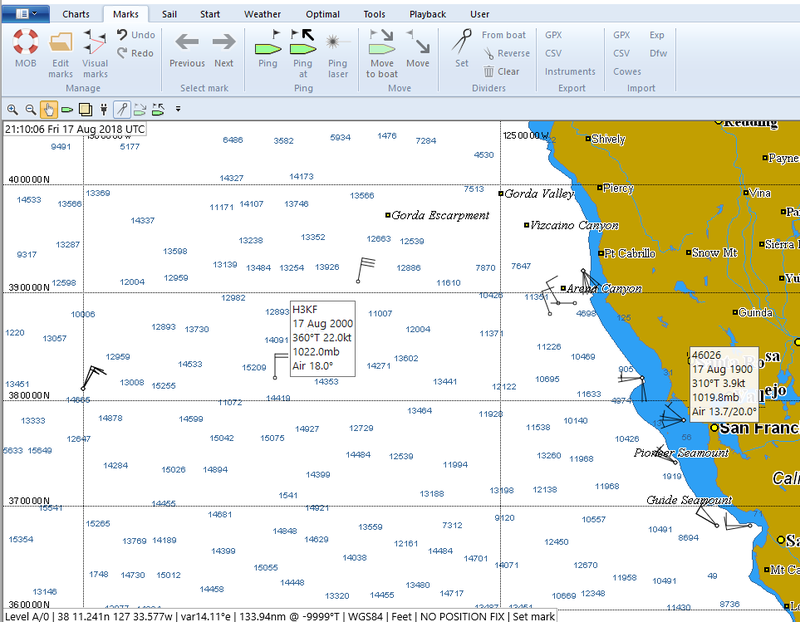 If you add a check to Ships and Weather Buoy Labels, you get the display below that emulates ship reports seen on surface analysis maps. 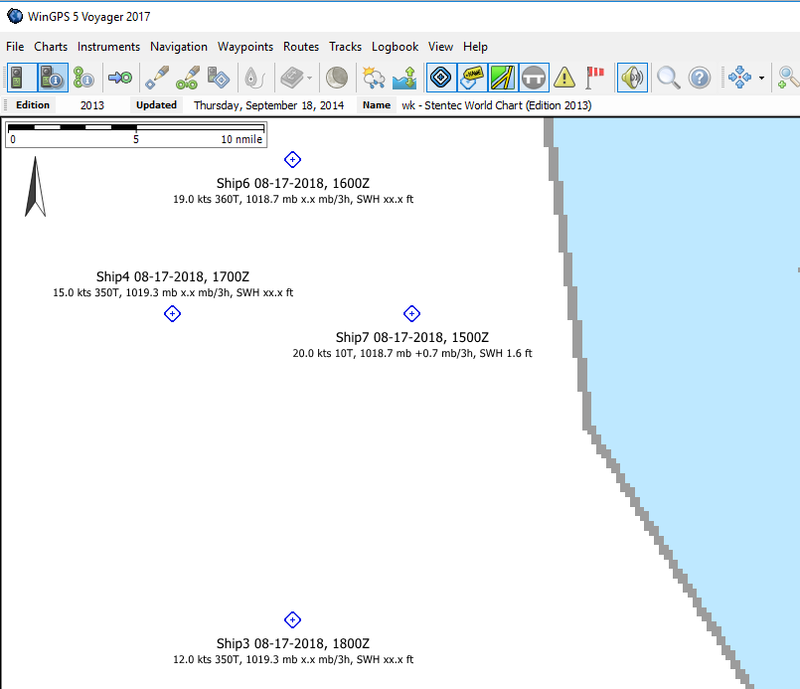 With or without the labels, a mouse over shows both the native Exp reports (tall rectangle) as well as our GPX reports (horizontal rectangle) when they are duplicated. One possible value of the GPX reports is they are not removed when you Reload the Exp reports. 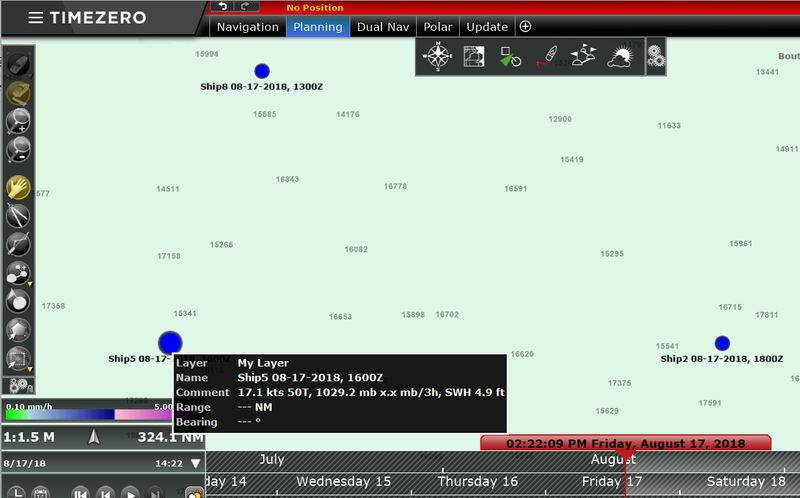 The native Exp service always brings in the latest 3 hr of observations, which are updated with the Reload button. The label (i.e., WTEG) is likely unique to the vessel or voyage, but seeing the route of 4 or 5 reports in a line across the chart not only identifies the vessel, it can also be used to predict later positions for more reports. The Exp reports include air temp and DP (we have this only in the text part), and we add the pressure tendency (observed pressure change over the past 3 hr), which can be tactically valuable. Discussion reemerged in class about a problem we have had in Quiz 2, #14, for maybe 20 years or more. The discussion was—as it turns out rightfully—questioned by an attentive student. We have to admit that the distinction between the unlabeled symbols for rocks and coral can no longer be distinguished by the symbol alone. Years ago when we wrote this question, this was more or less discernible in that the symbol for an area of coral often used a bold outline, whereas a similar region of rocks used a normal line width outline. which shows the coral segment in bold, but with the label coral or sometimes "CO," and now we see above it that rocky area can be bold or plain, with or without label Rocks or Rks. where bold is used on the top example with a more ragged symbol similar to the International coral symbol, then below it we see normal line width and no label. So we have to update our question and give up on any reliable distinction between coral and rocks based on the symbol style alone. 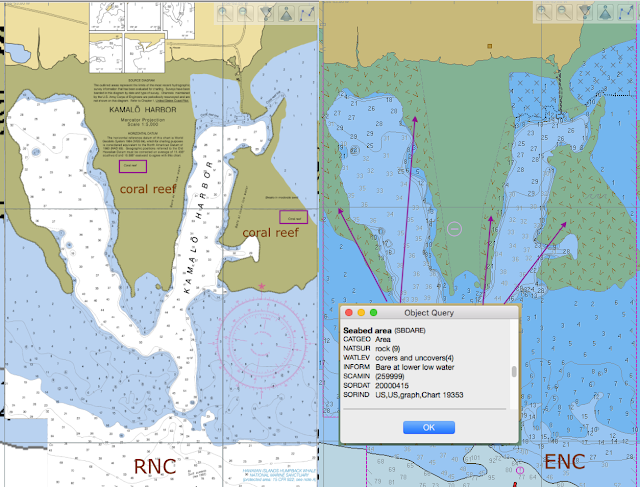 This is a bit sad, in that the beauty of nautical chart symbols are their ability to covey tremendous amounts of information by slight variations, which we have often stressed in class, but we certainly have to back off on this one. The real test of symbols, however, is to wander out into the real world and look at actual charts. 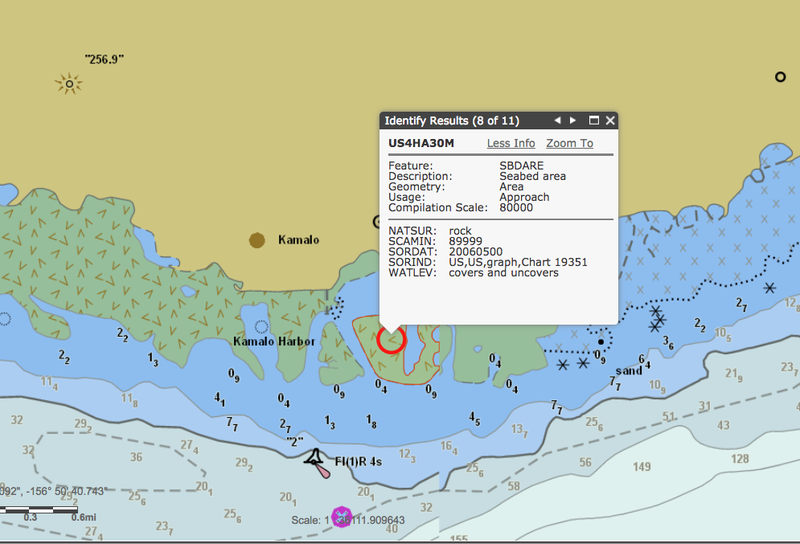 We can add to that the powerful tool of vector charts (ENC) which are made up of objects, in this case SBDARE (sea bed area), each of which has attributes, in this case, among others is NATSUR (nature of the surface), which in turn has categories, which in this case we look for either ID 9 rock, or ID 14 coral. Possible options are listed below. You can learn all ENC objects, attributes, and categories at Caris S-57 Object Catalog. Remarks: Click any link above for a list of definitions. The attribute ‘nature of surface’ encodes the general nature of the material of which the land surface or the sea bed is composed. Mixed bottom: where the seabed comprises a mixture of material, the main constituent is given first e.g. fine sand with mud and shells would be indicated as 4,1,17. Mud, sand, stone, rock are terms used for the general description. Clay, silt, gravel, pebbles, cobbles are more specific terms related to particle size. Crossed out items have been discontinued... could be telling us something about global warming! So the rock v. coral study proceeds as follows. Find a place where the symbol is in question on an RNC (i.e., paper chart) then open the corresponding ENC and click it (called a cursor pick) to see how it is described, which means what is the category of NATSUR at the place you clicked. We are not going to find coral in the Pacific Northwest, nor in New England, so sticking with the convenience of US charts, we are off to HI or the US Virgin Islands. Maybe the Florida Keys? 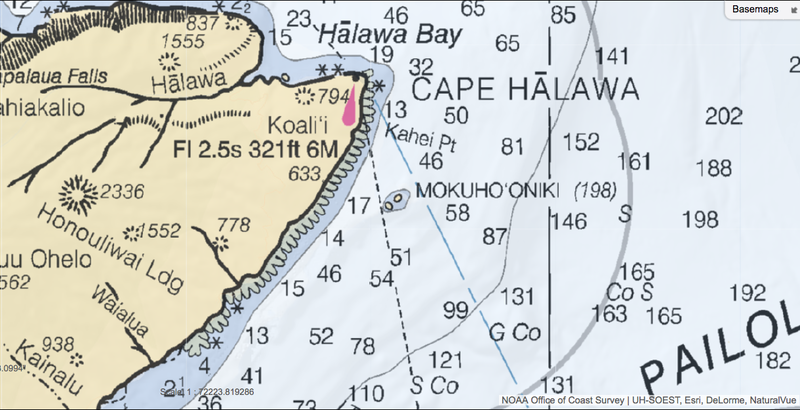 Below are samples from the south side of the island of Molokai in Hawaii. Here we see a coral beach between the two tanks. It is marked CO so we can expect this to be coral. Further around the coast to the right, at the NE tip (north side of the Pailolo Channel) we see more of this symbol, but without a CO, which leads us to believe this is not coral but rock. Now we can look at the ENC and check how they are encoded. And sure enough this is identified as rock. Now we go back to the two tanks to the south. And again, no surprises. This is called coral. Notice the thin red outline that defines the full object we clicked. We would get the same report clicking anywhere within that region. Now we click the region just to the right of that section to get this. Again, look at the region being selected, and compare this to the RNC of this region shown above. This is called rock. So the question comes up, is this a mistake, or is this simply more specific information. According to the paper chart insert for Kamolo Harbor this is a mistake, ie that RNC calls this zone coral. On the other hand, that chart is dated 2010, whereas the ENC of the same insert and scale is 2015. Since the ENCs are made from the RNCs, it is likely that this is new characterization, rather than an error.... but since it is very difficult to find a reason for caring about this particular area of hard stuff, we let it go. 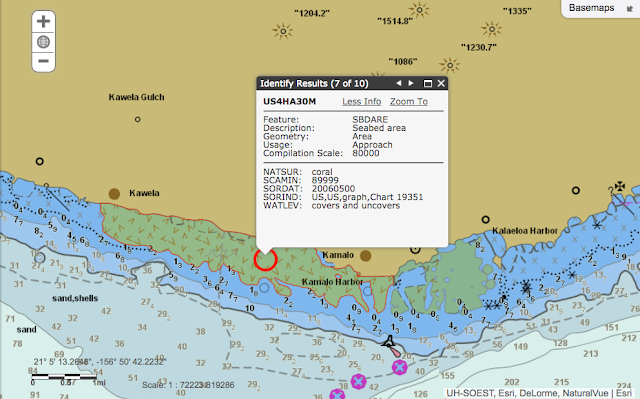 * * * We just got word back from NOAA that this is a charting error in the ENC of the Kamolo Harbor ENC inset. It will be fixed in their next release. This will be encoded coral next time, not rock. 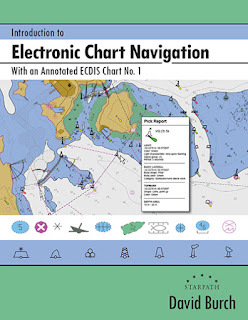 By the way, this is an important aspect of ENC vector charts, which have tremendous capability for detailed descriptions and they are easy to fix and fast to update. This was an error, but you can also add new information about objects. For example, you might see a prominent tower charted that has a light on it. A cursor pick will show at least two objects at that point, a LIGHT and a BCNSPP (special purpose beacon). Attributes of the beacon will be name, color, purpose, color pattern and so on. If any of those seem important and are missing (ie it is horizontal stripes black and white), you can report this to NOAA, ideally with a picture attached, and they can add those attributes to the object. In short, the ENC will just get better with time, with the help of mariners. There is another attribute called CONVIS (visually conspicuous, yes or no), which is always good to check when things are in doubt. 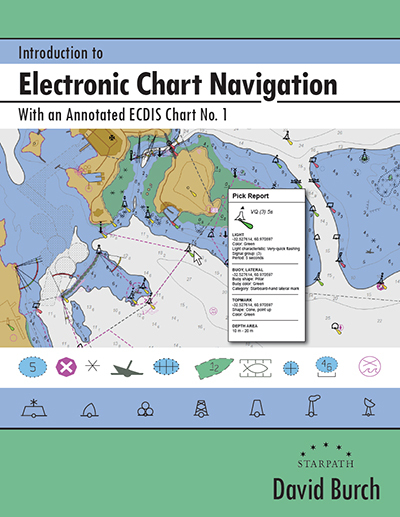 If ENCs are new to you or not often used, we do have a textbook that explains their use in depth, along with comparisons to RNC, as well as good practice in electronic chart navigation more generally. This exercise led to me making a georeferenced Google Earth screen cap of the entrance to Kamolo Harbor that could be overlaid on the charts to see if the bottoms could be distinguished in any manner, and that led to another discovery about that process, which is still underway. When that is sorted out I will add a video here with more discussion of this latter process....which in principle is a fast easy trick, and indeed ideally suited for planning an entrance into Kamolo Harbor.